IT seems unlikely that a developing country with fewer than six million PCs and two million internet connections should be touted as global force in IT outsourcing – but, then, India has never had a reputation for being predictable. With nearly one billion inhabitants, India already lays claim to producing an impressive 30% of the world’s information-technology professionals and to generating more than $6 billion (£4.2bn) in software exports in 2000/2001 – impressive figures, which jar with the fact that a third of the population is too poor to afford an adequate diet, and the national literacy rate is roughly 50%. However, India’s software industry is becoming excited about a new opportunity – in the shape of the United States economic downturn. The industry is keen to find ways of leveraging “offshore” outsourcing capabilities that are already being used by 185 Fortune 500 companies. The most bullish reports suggest that, by 2005, the Indian software sector’s business from US giants – such as Citigroup, Compaq, General Electric and Oracle – will have trebled in size. 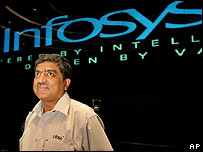 The leading players – Infosys, Mastek, Satyam, Tata and Wipro – are not necessarily household names, even in their native India. However they are established companies now doing a massive land-grab in the global market for outsourced IT and software development. Their rapid growth is being fuelled by the corporate mantras of cost-efficiency and improved productivity that are sweeping through boardrooms on both sides of the Atlantic. Already, Bill Gates’s Microsoft says it does 22% of its research and development in India. And last week the CEO of Intel, the world’s largest chip-maker, admitted that the US slowdown offered India a unique opportunity. The bosses of Indian-based outsourcing firms such as Infosys and Cognizant have stressed to local Indian newspapers and investment analysts that pursuing long-term, large-volume IT partnerships is the key to boosting revenues and margins. And it seems clear that the industry is gearing up to attack the global market with the same quasi-religious fervour that it has already adopted in turning India into a world-leading software and technology hub. Senior executives in the Indian “offshore outsourcers” claim there has been a real turning point in how Western firms perceive the outsourcing of information-technology work to the subcontinent in recent months. Cast said: “When I started with Mastek in 1993, UK companies and organisations were doing this in a clandestine way. For whatever reason, people outsourcing IT projects to India just didn’t want to talk about it. Mastek argued that its model of outsourcing IT projects can save organisations 30% to 40% of their IT budget and claims that 94% of its projects are on time and on budget, which Cast said is a “stunning statistic and a key element of our sales pitch”. At a time when the bottom line has become God, the ability of IT department bosses to discover a way of reducing costs from $70 (£49) per hour per person to $24 (£17) through outsourcing has obvious appeal. Whether it is application management or the re-engineering of existing applications, the savings are clear. An optimistic NASSCOM projects growth of 40% to 50% in the next financial year, despite the obvious danger of a considerable slowdown in IT spending. However, NASSCOM is not completely oblivious to the issue and has scaled back its software-export projections for 2001/2002 from $9.5bn to $8.5bn (£6.7bn) to (£6bn). Although business from the United States accounts from more than 75% of the Indian software sector’s revenues, IT managers in Britain are not immune to its charms. In a recent survey of IT managers in FTSE 100 companies, 47% said India was the top destination for outsourcing development. IT directors are becoming more confident about outsourcing projects to locations thousands of miles away – as their increasing desire to speak out testifies. And, if the domino effect can overcome a natural resistance and scepticism, then future hurdles to growth will be removed, claim India’s software chief executive officers. But how has India been able to develop such a pool of technology expertise? Insiders put it down to a mixture of an education system that places particular emphasis on disciplines such as mathematics and logic, the size of the country’s middle class and the social status of being a software engineer. But, even though Mastek has already signed up leading Scottish IT services company Newell & Budge as a client, other Scottish software professionals remain sceptical about having an IT supplier based thousands of miles away. Tom Burnet, managing director of the Edinburgh-based software developer Cedalion, said there has always been a nervousness about outsourcing development work, especially if a close dialogue between developer and client proves difficult to maintain. With Cedalion developing financial-services applications for clients such as Insurance Direct, Royal Bank of Scotland and Abbey National, Burnet suggested that even “being 15 minutes from the customer can often make communication difficult”. There have been suggestions that the recent collapse of MoTech, an Indian firm that had ambitious plans to create a European development centre in Livingston, West Lothian, was a sign that the outsourcing model may be flawed. Backed by some of the shareholders of Reliance of India, MoTech went on a hiring spree and had targeted 100 staff by the year’s end and sales of £150m within five years. Six months later, it gave up the ghost and closed its Livingston development centre, with the loss of 62 jobs. But Phil Britton, an experienced software developer and head of Mastek’s Scottish operations, says that he does not believe the closure indicates any weaknesses in the offshore outsourcing model. “Their overheads were way too high and they had recruited a lot of very expensive people but did not have enough money coming in. India’s software gurus argue that a combination of IT connectivity has brought about the death of distance and that service contracts – expected to be one key element of their growth – do not require the same close dialogue as the development of business-critical high-end software. Cast said that, on every project for a UK client, IT experts located in Mastek’s Indian development centres are matched on a one-for-one basis with someone working on-site at the client’s UK premises. “There are parallels with the ‘buddy’ system used in diving,” he said. Expensive software development disasters are common among big corporates, but they tend to receive very little publicity. Software outsourcing itself has produced its fair share. But, ultimately, although fears about distance are valid, the creation of bug-ridden software that is both late and over budget can still seemingly be achieved with relative ease by software companies working in the pockets of major clients. India’s politicians are becoming excited about the scale of the opportunity. Some believe the info-tech industry could help eradicate the country’s trade deficit, especially if the market reaches $50bn (£35bn) by 2008. With tens of thousands of skilled, English-speaking IT staff expected to return to India this year as more job layoffs hit America, India’s IT players will clearly find themselves even more capable of handling foreign clients’ software contracts.